Antarctica is the southernmost continent on Earth. Located around the South Pole, it is surrounded by the Southern Ocean and by theseas of Ross and Weddell. With an area of 14 million square kilometers, Antarctica is smaller than Asia, Africa or America, only Europe and Oceania are smaller than it. 98% of its surface is covered with a layer of ice with an average thickness of 1,6 km. Therefore the morphology of the basement Antarctic remains little known or unknown, while gradually unfolds the presence of subglacial lakes and mountain ranges such as subglacial Gamburtsev. The Antarctic continent is dry and cold. Since there is little precipitation except on its coastal parts where they are of the order of 200 mm per year, the continent itself is technically the largest desert in the world. There are no permanent human habitation and Antarctica has never had a native population. Only plants and animals adapted to cold, lack of light and aridity survive, such as penguins, seals, fish, shellfish, mosses, lichens, and many types of algae. The name Antarctica comes from a Greek word meaning the opposite of the Arctic. Although myths and speculation about a Terra Australis date back to antiquity, the continent will only be seen for the first time in 1820 by the Russian expedition of Mikhail Lazarev and Fabian Gottlieb von Bellingshausen. However, the continent attracted little interest until the late nineteenth century, mainly due to its harsh environment, its supposed lack of natural resources and its geographic isolation. Following the Antarctic Treaty signed in 1959 by twelve States and followed in 1991 by the Madrid Protocol, the continent acquired a special status, where both military activities and the exploitation of mineral resources are banned, except for scientific purposes. Current experiments are performed by over 4000 scientists from various nationalities. Regarded as a natural reserve, the continent is protected by the Convention on the Conservation of Wildlife and Marine Living Resources and various international agreements on biodiversity protection and the restriction of tourism. The continent has about 90% of land ice and 70% of global freshwater. If all this ice melted, the seas and oceans would rise by 60 m. Almost anywhere within the continent, rainfall is low, less than 20 mm per year. In some areas of blue ice, rainfall is lower than the amount of water lost by sublimation. The local water balance is negative. In the dry valleys the same effect occurs on a water bedrock, creating a landscape of arid type. Western Antarctica is covered by ice sheets. This has been due to recent concerns of the real, but small, risk of future collapse. Antarctica is the coldest place on Earth. It is on this continent that the lowest natural temperature of the planet, -89.2° C was recorded at the Russian station Vostok July 21, 1983. For comparison, it is 11° C lower than the sublimation temperature of carbon dioxide. The South Pole receives less than 100 mm per year on average. In winter, temperatures reach a minimum between -80° C and -90° C inside the territory. The maximum temperatures between 5° C and 15° C are reached near the coast in summer. The sun often causes health problems such as photokeratitis, because the majority of ultraviolet rays hitting the ground are reflected by the snow. Antarctica is the coldest area of the Earth. It was long believed that it escaped to warming and ice melting. Meteorology and climatology are particularly complex because of its vastness and its poor accessibility. The weather stations are therefore often near the coast and satellites can not correctly measure the surface temperature in the absence of cloud. Each year an area of low concentration of ozone, or hole in the ozone layer, increases above the Antarctic. This covers the entire continent and reaches its maximum size in September. The most durable hole was registered in 2008 and remained until the end of December. The hole was detected by scientists in 1985 and has tended to increase with the years of observation. The decrease in the amount of ozone is attributed to the emission of chlorofluorocarbons in the atmosphere, which break down ozone. 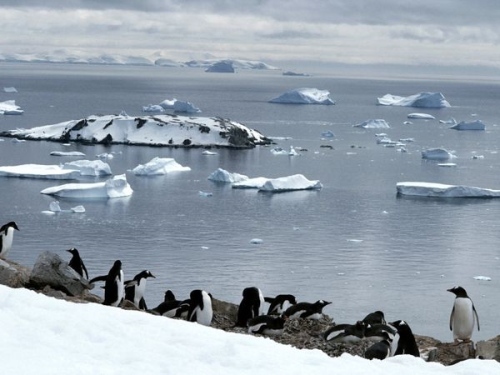 The Antarctic fauna is marked by the southern Cretaceous fauna, including fossils of several species discovered in the nineteenth and twentieth centuries. Several species are listed as endemic animals. Giant reptiles and amphibians, dinosaur or mammals lived there, but nevertheless, few dinosaur fossils have been discovered in Antarctica compared with other continents. The climate from tropical to polar appears to have resulted in the disappearance of virtually all living species. The only autotrophic present on the mainland are mostly protists. Antarctic flora is mainly confined to mosses, algae, fungi and liverworts that grow usually only a few weeks in summer. No agriculture has ever existed in Antartica. Transportation in Antarctica have been enhanced by human technology: the remote and isolated areas traversed by the early explorers are now transformed into more accessible areas to land transport, air and sea but also, more responsive and faster in particular by use of icebreakers. The use of sled dogs is now banned because dogs are an alien species in Antarctica and their status as top predators are a threat to local game wildlife.